When I finished up the round breakfast table I was pretty certain that I had depleted my stock of inch-thick cherry leaving only some heavier stock. As it turned out this was a mistaken assumption and there were still a few scraps on the shelf. I took the larger scraps and glued them up into a blank meaning to make a round top for a candle stand and having one of these already made would provide motivation to go ahead and finish one up. The round top eventually grew into this project. So far as I know this design is totally unique. The Shakers in the very earliest days built candle stands and sewing stands in this peg-leg style but the sewing stands invariably seemed to be rectangular in shape, presumably since placing a lip on a rectangle is relatively easy. I liked the primitive look of the peg legs as a contrast to the Sheraton style they later took up and evolved into their famous "spider" legs. I have already made a walnut candle stand based on the later style and wanted to try something different. 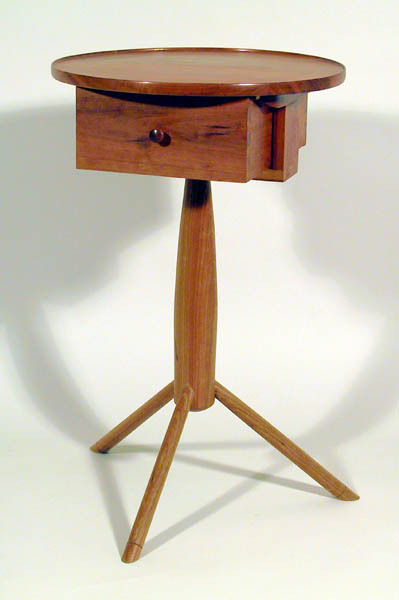 The overall design of the stand is within the Shaker norms, being a combination of the round-topped candle stand with an added drawer and a lip on the top which was meant to keep small items from falling off. I added the lip by turning the top as I would a wooden platter leaving a ⅛-inch high and wide rounded lip. The column and legs are relatively stout and the legs are widely splayed to add stability. The drawer opens from either side and has two identical pulls. 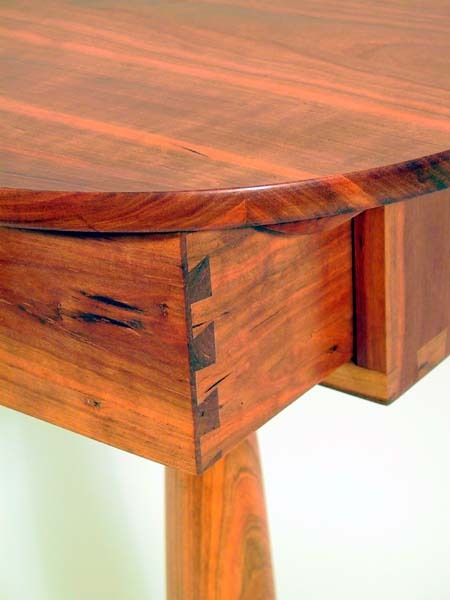 The joinery of the drawer is half-blind dovetails front and rear with the solid poplar bottom fitting into a dado. The legs are ⅞-inch at the post and are tapered to 1-inch at the "foot" end. The yoke that supports the top fits onto a turned 1½ inch tenon on the post and has through-dovetails at the bottom and tenons at the top. The stand'ss top is screwed onto battens which fit on the yoke'ss tenons and also act as the slides for the hung drawer. All wood is cherry with the exception of the poplar drawer bottom and hard maple slides which suspend the drawer. Overall size in inches: 18 X 29. Finish at the moment is nothing more than boiled linseed oil. I will wait several months for the cherry's color to darken before deciding on a film finish for it.